A furnished tiled terrace outside the living room provides a great spot to while away the hours and there is also a barbecue for conjuring up alfresco meals. All units come with a private heated pool with sunbeds, BBQ and patio furniture. A seating area, a sofa, a flat-screen TV via satellite , DVD player and a fully equipped kitchen with a dining area. A oven, microwave, refrigerator with freezer, washing machine and dishwasher are also featured, as well as a coffee machine, kettle, iron and board. The holiday home offers a patio for sunbathing around the private heated pool for private relaxation. Ideal for golfing holidays, 3 mins drive to nearest golf course. 4 hours from the UK and Ireland and little over 50 miles from the coast of Africa, there is sunshine year round. This island is on the same latitude as Bermuda, Florida and Kuwait ! The house has 2 bathrooms, Both bathrooms have full shower facilities as well as baths and the property has a 100 litre hot water tank, enough for all the family. The property was filthy, poorly maintained and very disappointing overall. I am happy to submit photos if you want to contact me. The "Heated Pool" was not heated and there was a note from the owner advising of his contact details and an extra charge if you wanted it heated. This surely needs to be on the website? The location is ideal but the pictures do not reflect the standard of this property. The fridge had no shelves in the door. The coffee machine was antique and apart from some coffee filters there was absolutely nothing which would assist you setting up a kitchen. No salt pepper or anything. Last guest took everything ? I doubt it. Previous places I have stayed accrued things which assisted or the owner even provided a loaf, milk water etc. The internal furniture is poor as described by a previous reviewer although the wifi was ok.
Shower was awful with mould growing around the entire base in the upstairs bathroom and the bin had no lid. Towels were almost transparent and long past their sell by date. The mattresses on the beds were the thinnest I have ever seen outside of a prison cell. The graffiti ,entitled by earlier reviewer was still present if you poked your head over the wall. This place needs an update in what I would imagine is a very competitive market. I have photographs confirming all of this. I would not stay here again or recommend it. We had a great holiday in this villa. The location is good for the old and the new town, plus lots of bars and restaurants on the walk down. Bit of a walk up hill back but 3 euros in a cab. Local supermarkets within 5 min walk for all shopping including a Lidl. The villa was clean and had everything we needed. The patio gets the sun all day and is sheltered and private. I would say this is excellent value for money and Luis was very responsive whenever I talked to him. Only thing missing in the kitchen was a jug for our sangria, which we didn't mention while we were there or I am sure one would have appeared - Luis can you sort that for next year please !! We´ve just camed back from our holidays, the truth is that i was very worried after reading some of the reviews. When we arrived everything was tidy and clean. The villa was very calm and quiet, perfect if you want calm holidays.The villa was very sunny and bright. They weren´t buildings work noises around the villa. The wifi worked very well. The pool was very blue, the pool man camed at the middle of the week to clean the pool. We visited Villa Luis in Oct and had some concern about the previous reviews. However it was very clear that the negative reviews were not accurate. This is a great villa spacious clean well equipped and a great location. 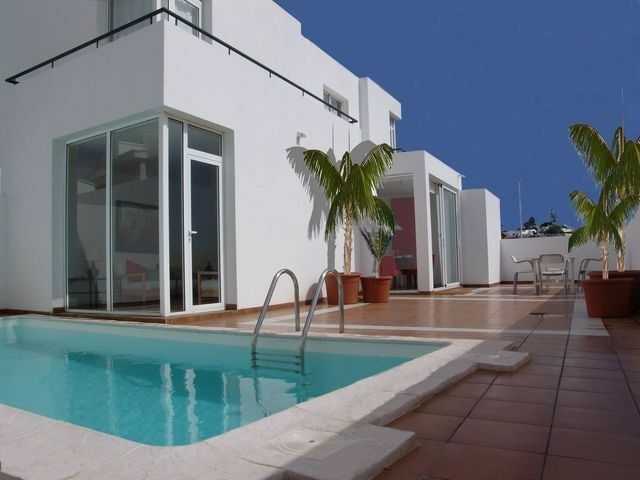 The poolside is a suntrap and we would definately recommend this villa. I have been going to Lanzarote for over 20 years and Villa Luis is by far the worst villa I have ever stayed in! Don't be fooled by the description and photographs in the add!! It has substandard furnishings throughout e.g. Well worn suite that has no cushioning left, curtains that don't fit the windows, rusty terrace furniture, dirty and broken sun beds, pool is unclean with a tide mark around it and wi-fi is non existent. Main outlook is onto waste ground full of graffiti and where people walk their dogs. Sea view is from the top floor, standing on your tip toes - you can just see the sea horizon through the other buildings on a clear day if you're lucky. Had issues from day one of arriving with builders next door - cutting tiles which was creating a mess on and in the pool as well as the poolside. At one point a crane was lifting a cement mixer over our pool where our kids were playing. Owner was sent numerous e-mails with photos and videos as evidence. He advised that he had no knoledge of the work but other reviews show he was more than aware of the work before we arrived - he just wasn't interested and just kept stating it was out with his control and quoting the terms and conditions. I agree it was out with his control but what was within his control was an apology and to send cleaners round which didn't happen. As a result we couldnt spend any time at the villa during the day, the pool was green and un-swimable for the last week. The owner did send a pool cleaner round with only 2 days left of our holiday which was too little to late. In summary - avoid at all costs. You'll find far superior villas for the same price as you are paying for this. But these small works started unexpectedly a few days before your arrival. The neighbour had the authorization of the city council and these works were totally out of my control. The old harbour, with its excellent selection of tapas bars and fish restaurants is only a 10 minute of a stroll, and is the departure point for many boat excursions around the island. 3 mins drive to nearest golf course. Golf: The villa is ideally located for golfing holidays. The Puerto del Carmen golf course just 3 mins drive. The Costa Teguise golf course just 20 minutes drive.